The Second Saturday workshop was developed by WIFE, the Women’s Institute for Financial Education, founded in 1988. WIFE is dedicated to providing women with information and education during life transitions and their quest for financial independence. The workshop is held the second Saturday of each month, and is designed to help people going through a divorce or thinking about a divorce take the next step in their life, no matter where they are in the process of divorce. The workshop deals with the legal, financial, family, and personal issues of divorce in a logical, compassionate way. With the guidance of trained professionals, workshop participants gain greater understanding of what can otherwise be a very confusing process. 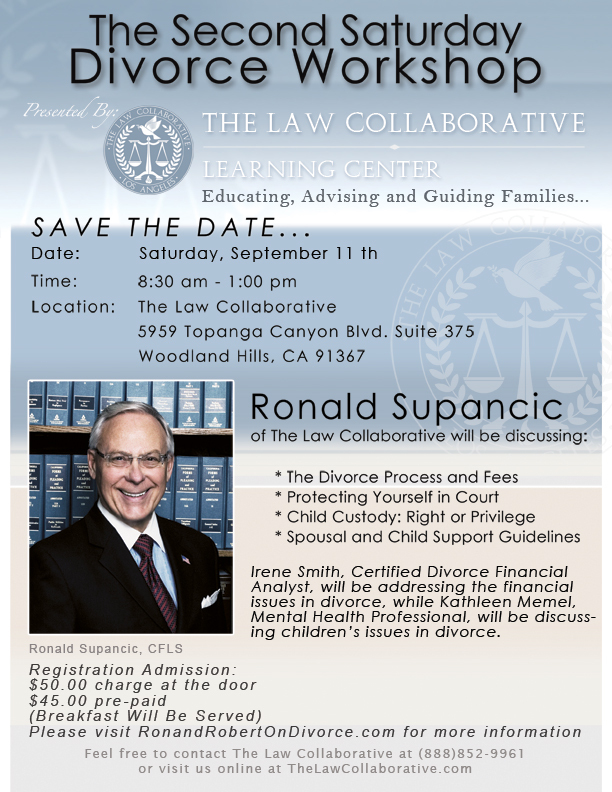 Second Saturday is a great opportunity for people anywhere in the divorce process. Our next Second Saturday workshop is scheduled for Saturday, September 11, from 8:30 a.m. to 1:00 p.m., and a delicious breakfast is included. 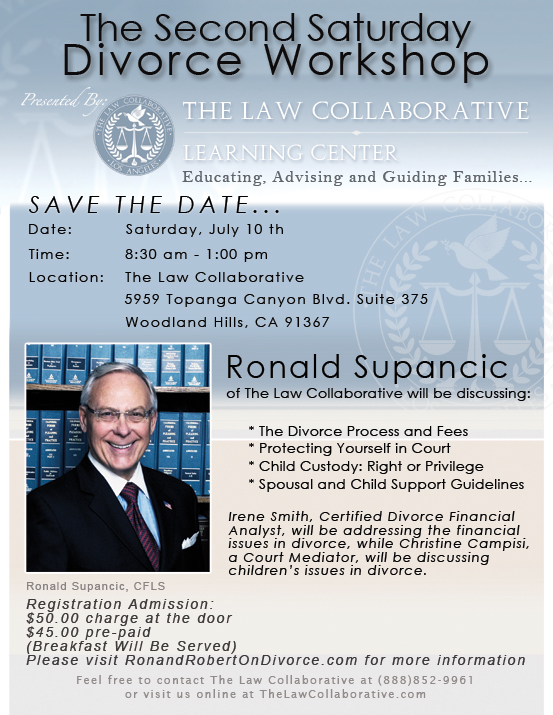 The day’s speakers include Certified Family Law Specialist and co-founder of The Law Collaborative Ron Supancic, Certified Divorce Financial Analyst Irene Smith, and Licensed Marriage & Family Therapist and Divorce & Child Custody / Family Mediator Dr. Kathleen Memel. 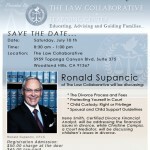 To register for the event, or if you’d like more information, email Info@TheLawCollaborative.com. We are happy to be hosting our monthly Second Saturday Workshop on Saturday, August 14, 2010 at our Woodland Hills office. 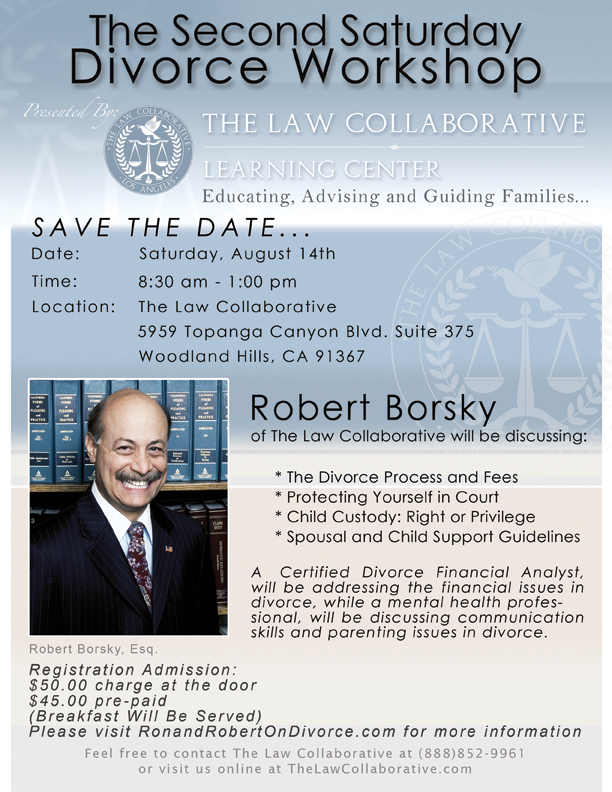 Attorney Robert Borsky will discuss the steps to divorce from beginning to end, what to expect in the way of necessary and reasonable fees, how to protect yourself in court, and the in’s and out’s of child custody and child/spousal support. A Certified Financial Analyst* will address the financial issues of divorce and a mental health professional** will be on hand to discuss communication and parenting issues that so often come up for divorcing parents. Remember to follow us on Twitter, be our friend on Facebook, subscribe to our podcast on iTunes and don’t forget to “Like” our two Facebook pages: The Law Collaborative and Ron and Robert on Divorce. See you at the workshop in August! What followed was a trip by Bill and Mary to see a lawyer who helped them draw up a divorce settlement along the lines that Mary wanted. The whole thing was accomplished for a few hundred dollars, and Bill moved out of the house to live with his parents. In the months that followed, Bill’s anger finally erupted. He secured a lawyer and pushed a long, bitter, and futile suit for custody of his children. In the end, he emerged with a considerable debt to his lawyer and nothing more to show for his trouble — except for one thing. The pain had taught him to see himself fmore clearly. Bill’s divorce, the thing he had feared the most, had been, in the end, the costly crisis that had broken him free from self-defeating behavior that had persisted unexamined throughout his married life. It took several years, but before it was over, he had taken custody of his children with the consent of their mother. Being a single parent gave him the opportunity he needed to put some muscle in his resolves to take responsibility for himself and those he had been given to care for. 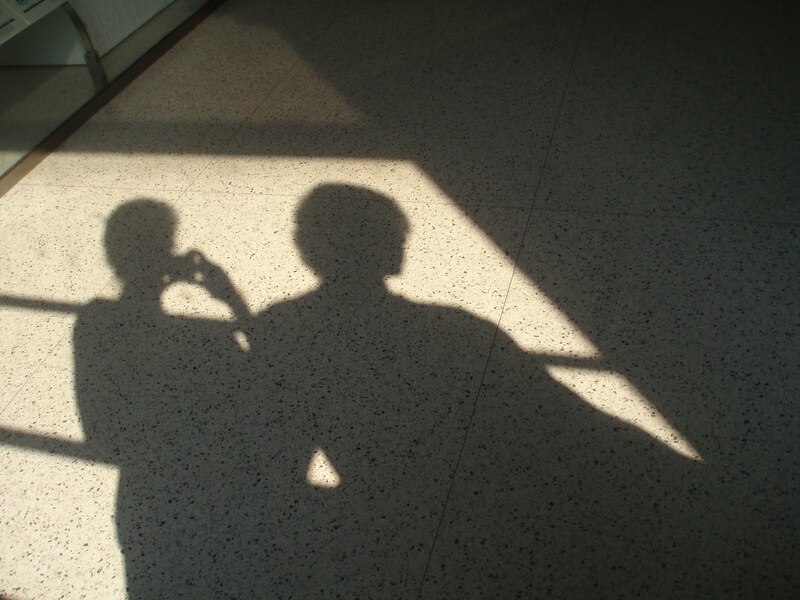 Before two more years had passed, he met a woman who was willing to share his life. They were married and moved ahead into the unfamiliar waters of step-parenting and rebuilding a full-fledged family. As of this writing they are moving on course, thanks largely, in my opinion, to Bill’s willingness to break with his old patterns of indecisiveness. One way Bill exhibited his unwillingness to take responsibility for himself and his marriage was the acquiescent way he tagged along to see the same lawyer his wife had selected. He would have been wiser to find a lawyer for himself, an advocate to represent his interests. Instead he followed a policy of appeasement. Not uncommonly I have observed a tendency among some people to confuse appeasement with willingness to change. The reason Bill proceeded imprudently through his divorce was that he violated a cardinal rule it has taken me years to learn: In order to derive any benefit from a divorce, you must separate the emotional divorce from the legal divorce. Making that separation is a big order, but it is vital. Gale — the young woman who was married to Jack the drug dealer — was able to do it. She used her head and took an important setp to protect herself. Hers was a temporary divorce, if you will, that resulted not in the dissolution of her marriage but in the resolution of her problem. It is absolutely necessary that we acknowledge the role we play in our own lives, that we take responsibility for how our actions affect the situations we find ourselves in. 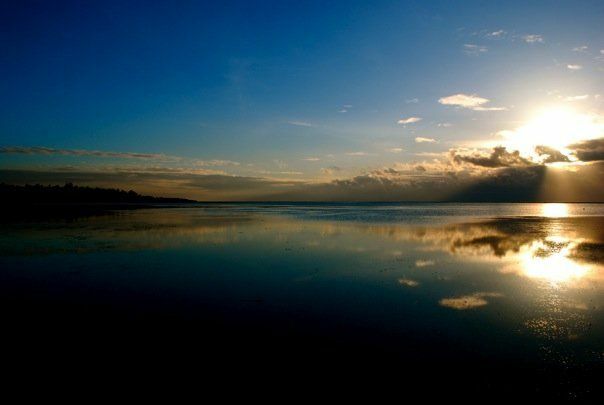 Divorce has the ability to make us feel as if the wind has been knocked out of our sails, as if we are drowning and out of control, as if we are victims to whom terrible things happen. But that doesn’t have to be true. Divorce can be an opportunity to change your life for the better. It is up to us to take control of our future and our happiness. 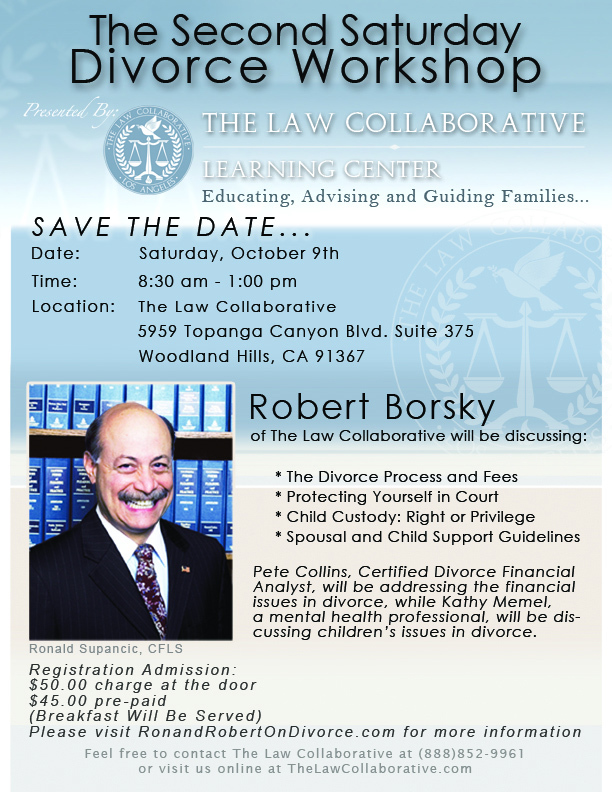 This Saturday we are hosting The Law Collaborative’s Second Saturday Divorce Workshop for Women. 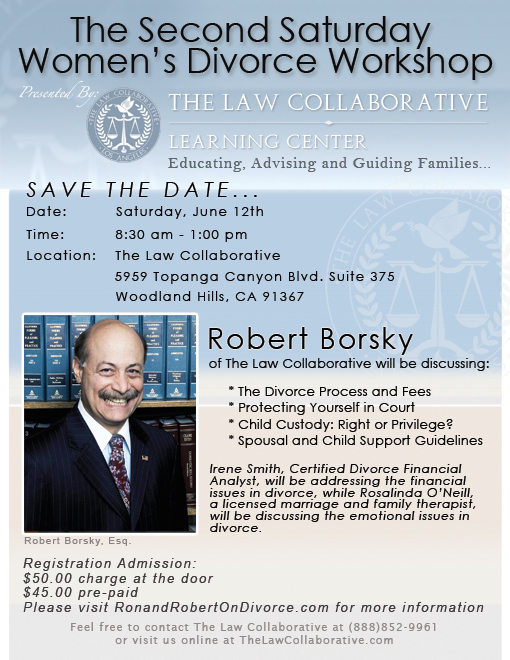 Attorney Robert Borsky, CDFA Irene Smith and LMFT Rosalinda O’Neill will speak on the various financial, emotional and legal issues that surround divorce. The workshop begins at 8:30 a.m. and ends at 1 p.m., pre-registration is $45 or it’s $50 at the door. This is an opportunity to empower yourself, educate yourself, learn about your rights, and learn how to protect yourself in court. 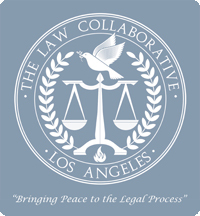 If you’d like to pre-register, email IG@thelawcollaborative.com or call our toll free number now: (888) TLC (852) – 9961.